Rewards Canada: October 10 Update: Fly WestJet lie flat business class for about $1,600 one way, BMO Rewards pay with points rate and more! 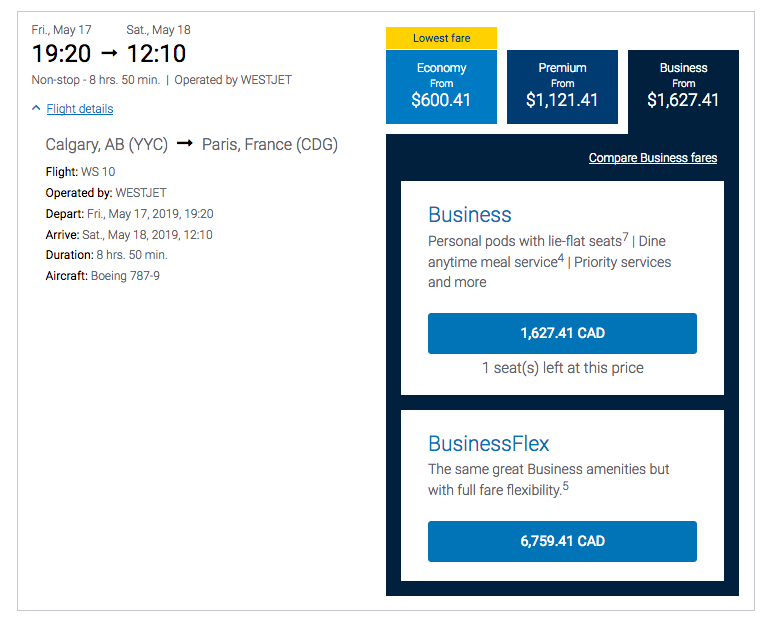 October 10 Update: Fly WestJet lie flat business class for about $1,600 one way, BMO Rewards pay with points rate and more! Today has been all about WestJet and WestJet Rewards and we continue to talk about it a bit more here in our daily update. The tickets for the new Boeing 787 long haul flights are now available for purchase and fares from Calgary to London, Dublin and Paris start around C$360 each way for economy class, $1,000 for premium economy and $1,600 for lie flat business class. Look at those full fare business class fares though..... Also I couldn't find any low business class fares to LGW in April and May - guess that's based on what AC may be pricing their LHR flights for. Another topic we discussed way back in January was BMO offering a pay with points feature that was coming soon to BMO Rewards. We missed the launch of it, it may have been a long time ago but who knows as we just came across it now. Anyways the feature is available and is offered at 15,000 points for $50 credit. This translates to a cash back return of 0.67% to 1% for the BMO Rewards World Elite Mastercard as that card earns to 2 to 3 points per dollar spent. Other cards will of course be less than that. Again BMO did themselves a disservice here with that option when you compare this to a couple of other popular travel rewards cards that have this option: Amex Cobalt is 0.7 to 3.5% while the Scotia Amex Gold Card ranges from 0.67% to 3.2%. Sure on the low end they are similar but Find out more here.